Which Ice Sheet Will Flood Miami? There is a general consensus among Earth scientists that melting of land ice greatly contributes to sea-level rise (SLR) and that future warming will exacerbate the risks posed to human civilization. 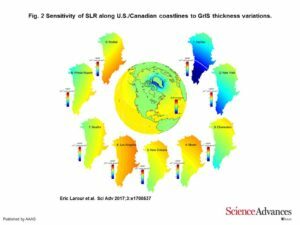 As land ice is lost to the oceans, both the Earth’s gravitational and rotational potentials are perturbed, resulting in strong spatial patterns in SLR, termed sea-level fingerprints. We lack robust forecasting models for future ice changes, which diminishes our ability to use these fingerprints to accurately predict local sea-level (LSL) changes. For the rest of us, according to the Gradient Fingerprint Mapping Simulation, about 47% of Miami’s sea level rise will come from glacier/ice sheet melting at the rate of about 1.333 mm/yr. Almost half of that will come from the Greenland Ice Sheet, the second largest ice sheet in the world. 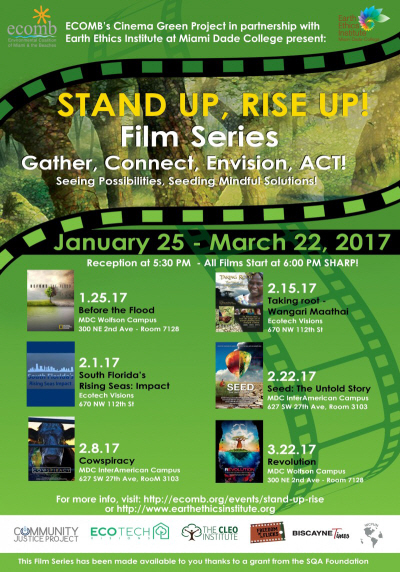 On Wednesday, February 1, at 5:30 p.m., ECOMB’s Cinema Green Project, in partnership with Earth Ethics Institute at Miami Dade College, presents “South Florida Rising Seas: Impact” from the Stand Up, Rise Up! film series. The film will screen at EcoTech Visions, 670 NW 112 Street, Miami, FL 33168. There will be a special presentation of “Global Warming – Changing Oceans” by Captain Dan Kipnis; and a panel discussion movie producer Juliet Pinto, climate monitor Mitchel Chester, and Captain Dan Kipnis. All Stand Up, Rise Up! films are free, but tickets through Eventbrite are required. The documentary is a compilation of stories that were produced by 33 video production students at Florida International University’s School of Journalism and Mass Communication and initially released as a 10-part web series on WPBT2’s YouTube site. The documentary’s first-person narratives take viewers through the Everglades, Miami Beach, Fort Lauderdale beach and finally, the Keys, where community leaders describe themselves as “the canary in the coal mine” of sea level rise. Viewers will also hear concerns of engineers, civic leaders, real estate and sustainability professionals and environmental advocates. Bringing about environmental change and awareness in our community is one of ECOMB’s primary goals. And this is exactly what Cinema Green Project is all about: through the screening of environmental documentaries, educate and increase the awareness among Miami-Dade County residents about pressing ecological issues in South Florida and around the world. The Cinema Green Project, produced in collaboration with the Miami Beach Cinematheque, is a monthly film series that fuses lessons learned from each screening with an opportunity to get involved in local sustainability efforts, yielding a more environmentally conscious society. In doing so, ECOMB hopes to inspire advocacy and action amongst the community and provide opportunities for positive change to occur. ECOMB is an environmental education nonprofit organization dedicated to promoting sustainable living practices, fostering environmental stewardship and preserving our community’s ecology. The Stand Up, Rise Up! film series is being shown at various locations in Miami, from January 25 through March 22. The next film is “Cowspiracy” on Wednesday, February 8, at Miami Dade College’s Interamerican campus, 627 SW 27 Avenue, room 3103. 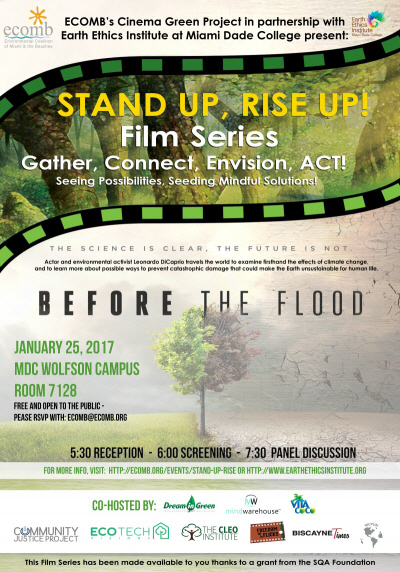 On Wednesday, January 25, at 5:30 p.m., ECOMB’s Cinema Green Project, in partnership with Earth Ethics Institute at Miami Dade College, presents “Before the Flood” from the Stand Up, Rise Up! film series. The film will screen at Miami Dade College’s Wolfson Campus, 300 NE 2 Avenue, Room 7128, in downtown Miami, There will be a panel discussion following the film with Caroline Lewis, CLEO Institute, as Moderator; and panelists Greg Hamra, of the Citizens Climate Lobby, and Delaney Reynolds, from the Miami Sea Rise Project. All Stand Up, Rise Up! films are free, but RSVPs are required. Email ecomb@ecomb.org. The Stand Up, Rise Up! film series is being shown at various locations in Miami, from January 25 through March 22. 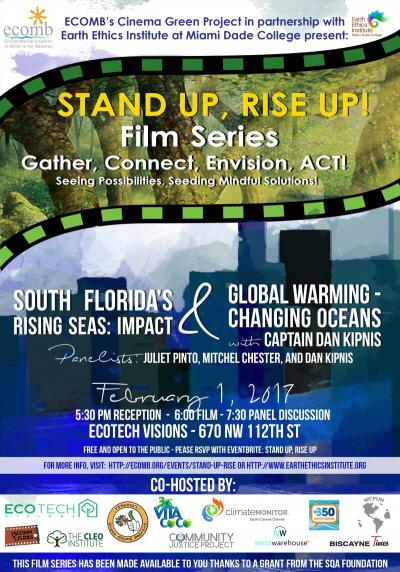 The next film is “South Florida’s Rising Seas: Impact” on Wednesday, February 1, at EcoTech Visions, 670 NW 112 Street, Miami, FL 33168. 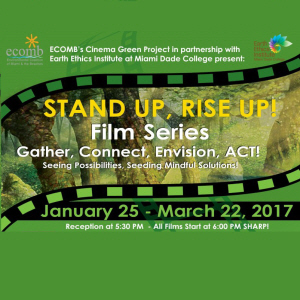 One of the many programs and events organized by the Environment Coalition of Miami and the Beaches is also one of my favorites – Cinema Green Project. Their current film offering is six of the episodes from Stand Up, Rise Up! The series will be shown at various locations in Miami, starting January 25 and running through March 22. 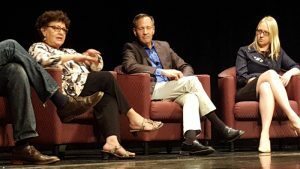 Last night I attended the “public program” portion of the 2016 “Design Matters” conference. 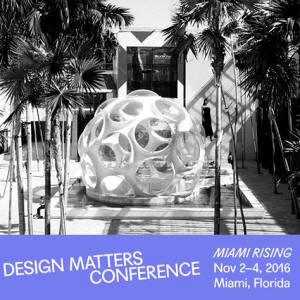 This annual event by the Association of Architecture Organizations which is taking place in Miami this year November 2 through today with the theme: “Miami Rising”. The public program was titled “Resilience and Citizen Action”. On the heels of Miami being named a new member of the 100 Resilient Cities network, Next City publisher and CEO Tom Dallessio hosts a round table discussion with several leaders (national and local) working to advance public action on climate change. Going beyond flood mitigation strategies and other tactical responses, our expert panel considers the broader thinking and opportunities for addressing the social and economic challenges that will come to define the “resilient” city in the coming years. Tom Dallessio started the evening of by asking “What is resilience?” A good question given the topic of the night, yet not so easy to answer. 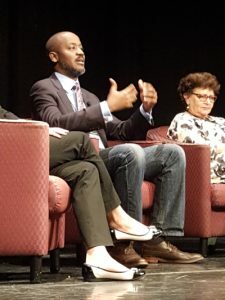 Otis Rolley offered that resilient cities are designed to “survive, adapt and grow despite shocks and stress” like a hurricanes or even homelessness while Ephrat added that resilience needed to include “the ability of municipalities to continue to function”. I liked the way Susanne put it best. She noted that we often talk of “bouncing back” from adversity, but she think’s resiliency is about “bouncing forward”. Caroline and Susanne mentioned that they have worked closely together, and gave each other credit for coming up with the “Three “S”s of Resilience”: science seriousness and solutions. They were not the only panelists to bring up science. Marissa strongly advocated for bringing local expert scientists to the table during urban planning sessions. She noted that she is “a policy person – not an expert seismologist or oceanographer”. In Los Angeles, she speaks to her science contacts weekly as part of her resiliency planning. When Tom asked each of the panelists to talk about resiliency in action, Susanne gave the example of Sunset Harbour on Miami Beach. The neighborhood used to have “sunny day flooding” issues – so much so that the current Mayor floated a canoe down the street as part of his election campaign. Since then the City of Miami Beach has invested in seawalls and pumping stations over last 2 years. Susanne said Sunset Harbour has become a “living laboratory” for climate change and city response to it. One of my favorite quotes of the evening came from Caroline. She said, “I am not an urban planner. I am an urban planner watchdog.” And as such, she wants architects and city planners to remember the importance of “climate justice”. Poverty is a critical issue, and not everyone has the resources to take individual action against climate change. As she noted, when someone is poor, they are so low on Maslow’s hierarchy of needs that climate change cannot be a priority when food and housing is. Nevertheless, climate change “harms the poor first and worst” as the United Nations put it, whether from the catastrophes of hurricanes or drought, or simply from extreme heat or cold in the cities. Caroline talked about the importance of cities providing misting stations, shade, and heat mitigation as a standard part of their urban planning to help minimize the human cost of climate change. Caroline also spoke about meeting residents in Liberty City and Little Haiti, and hearing their fears of “climate gentrification”. Because the land elevation in these neighborhoods is higher than other areas in Miami-Dade, they are already seeing predatory buying of property pushing them out of their historic homes. On the flip side, however, Ephrat noted that in the U.S., strong private property rights are a huge challenge to cities being able to achieve resilience. There is only so much city government will be able to do, and long-term resilience requires citizen action and participation. To that point, all of the panelists agreed that education was critical to the success of any city resilience plan. Not very comforting in light of results from a survey conducted by Caroline and Susanne. 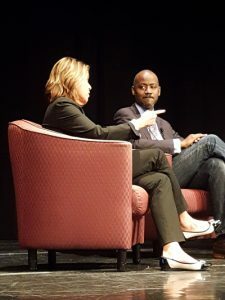 Six hundred students at Florida International University, University of Miami and Miami Dade College were asked to define change and and explain some of its causes. Each response was awarded points on a rubric created for the survey. So far, 400 student surveys have been completed. All have failed. Climate Reality video: Kids Can See It. Why Can’t We? “What’s the difference between the earth’s eco-system and Goldman Sachs? The world’s eco-system is not too big too fail.” That is just one of the jokes told in this amusing video about global climate change from the Climate Reality Project. Despite overwhelming international scientific consensus on climate change, the global community still lacks the resolve to implement meaningful solutions. The Climate Reality Project exists to forge an unwavering bedrock of impassioned support necessary for urgent action. With that foundation, together we will ignite the moral courage in our leaders to solve the climate crisis.